The 1916 Easter Rising and its aftermath changed Ireland for ever. The British government's execution of 14 republican rebels transformed a group hitherto perceived as cranks and troublemakers into national heroes. Those who avoided the British firing squads of May 1916 went on to plan a new - and ultimately successful - struggle for Ireland's independence, shaping their country's destiny for the century to come. But what sort of country did they create? And to what extent does post-1916 Ireland measure up to the hopes and aspirations of 'MacDonagh and MacBride / And Connolly and Pearse'? 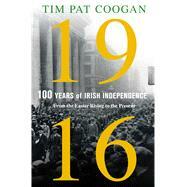 Best-selling historian Tim Pat Coogan offers a strongly personal perspective on the Irish century that followed the Rising - charting a flawed history that is marked as much by complacency, corruption and institutional and clerical abuse, as it is by the sacrifices and nation-building achievements of the Republic's founding fathers. TIM PAT COOGAN is Ireland's best-known historical writer. His 1990 biography of Michael Collins rekindled widespread interest in the revolutionary era and he is also the author of The IRA, Long Fellow, Long Shadow, Wherever Green is Worn, and The Famine Plot.